Glyptodons are distant prehistoric relatives of modern armadillos. Armadillos themselves are ancient creatures, with fossil records extending millions of years. The two species diverged early, but many similarities exist between modern armadillos and glyptodons, which went extinct approximately 11,000 years ago. While not much is known about the behavior of the ancient glyptodon, paleontologists glean facts about the mammal’s location, habitat and diet from fossils and where they are found. Both armadillos and glyptodons are characterized by a large bony shell, which acts as an armored shield to protect the animal from predators. They are the only mammals of their respective time periods to have true shells. Both animals also have short, stubby legs and soft, unprotected bellies. However, the glyptodon was far larger than any modern armadillo. A glyptodon was approximately the size and mass of a Volkswagen Beetle, while the largest armadillos are only about 3 feet long and weigh less than 150 pounds. Both species have a similar geographic range. Glyptodons originated in South America, eventually migrating north into what is now the United States by crossing the Isthmus of Panama. 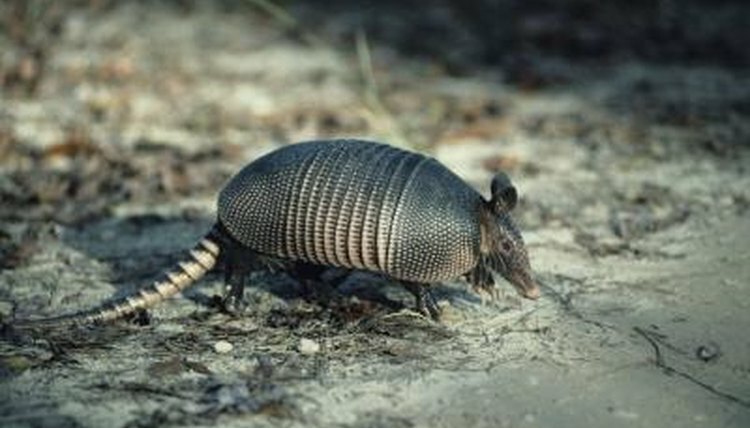 The modern armadillo also originated in South America. “Armadillo” translates from Spanish to “little armored thing,” the name given the animals by Spanish Conquistadors. Like the glyptodons, the armadillo also spread northward, a trend that continues. While armadillos historically were only found in the southwest United States, particularly Texas and Arizona, they have been found as far north as Nebraska. Arizona and Texas, two states heavily populated with armadillos, looked very different in the age of the glyptodon. While much of the habitat of the modern armadillo is desert, for the glyptodon this same geographic area was made up of rich grasslands and wetlands with abundant rivers and streams. Glyptodon fossil remains have been found close to fossilized river beds. Paleontologists infer from this that the ancient glyptodon preferred living close to rivers. When it comes to food, armadillos and glyptodons have little in common. Glyptodons were strict herbivores. Paleontologists believe they grazed on grass near rivers, perhaps even consuming the soft plants that grew in the water itself. Modern armadillos, on the other hand, feed primarily on insects and other invertebrates. They may occasionally eat carrion or small vertebrates, but they seldom eat plants.